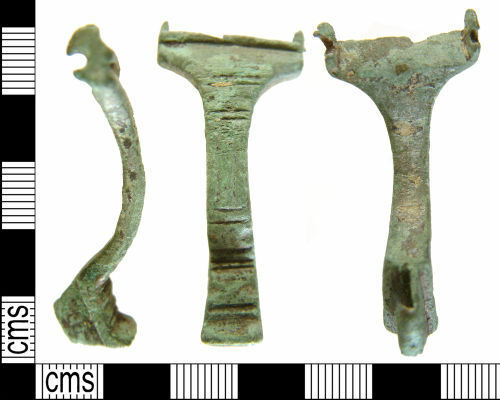 An incomplete Early Anglo-Saxon copper-alloy supporting-arm brooch, missing its spring mechanism and pin. It measures 42.86mm in length and weighs 8.05g, and dates to c. 420-c. 480 AD. The wings are flat with damaged D-shaped side lugs, which would have held the axis bar; the wings are 20.34mm wide. The top of the wings then is open to expose the missing spring. The bow curves out below a headplate consisting of a ledge projecting forward from either end of the wings, then narrows to 5.03mm widebefore widening slightly towards the lower bow (5.75mm wide), then again at the foot (6.48mm), flaring to 7.38mm where it projects forwards (c.4mm). The catchplate extends behind this portion c.9mm and runs down to the base of the foot. The brooch is decorated with two pairs of transverse grooves below the head, and another pair of transverse grooves before the foot (so two pairs of grooves at either end of the bow). Between are two very faint vertical grooves. The foot is decorated with a transverse groove at the top and a pair just before it kicks outwards at the base. The grooves retain traces of a black substance, possibly just the original patina. Supporting-arm brooches were divided into two types by Bohme (1974) summarised in English by Evison (1977). This brooch belongs to his Typ Perlberg, with narrower head and foot.